Something smells wonderful in the Frameyard. It’s not the wallflowers in the glasshouse or the thyme growing on the top of the old walls. It’s the fragrance of our newly acquired Scented Pelargoniums wafting from Glasshouse No. 5. These tactile plants release citrus, rose or woody scents and come to life when touched. We’d like to introduce you to these new plants, which we look forward to propagating in the future. But first a bit about pelargoniums in general. 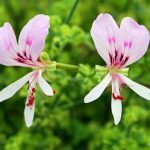 There’s much discussion about the difference between pelargoniums and geraniums as both are members of the Geraniaceae family. 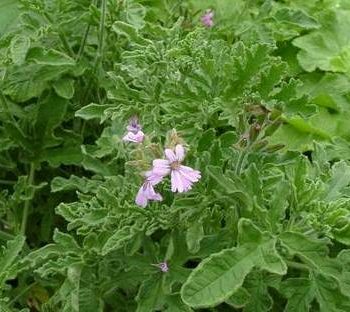 The name ‘geranium’ has its roots in Ancient Greece, having been used by Dioscorides, who was a Greek physician and botanist living around 40 AD. In 1753, Carl Linnaeus defined three distinct genera in his Species Plantarum – Geranium proper or “Crane’s Bill”, pelargonium or “Stork’s Bill” and erodium or “Heron’s Bill”. These names are based on the shape of the fruit of each genera. (The word pelargonium comes from ‘pelargos’ meaning Stork). The Geraniaceae family is a very diverse group of plants. One type hails from the northern hemisphere, while many of the sub-groups originate south of the equator. The hardy north European ‘Geranium’ and the half Hardy ‘Pelargonium’ are grown extensively in the ‘developed western world’. 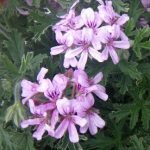 Whilst the common hardy Geranium is native to Europe the majority of what are botanically classed as ‘Pelargoniums’ come from South Africa. 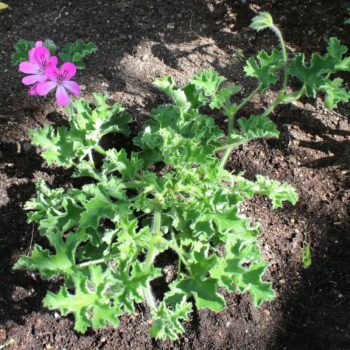 Scented Leaved Pelargoniums – Grown chiefly for their fragrance, may be species or cultivars but all must have a clear and distinct scented foliage. Scent is emitted when the leaves are touched or bruised with some scents being aromatic, others pungent and in a few cases, quite unpleasant. 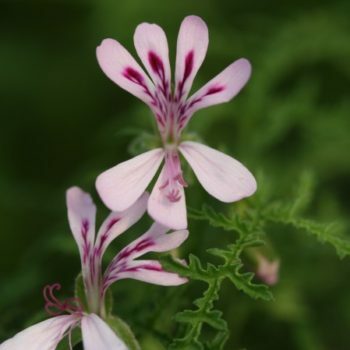 Several of the scented leaved pelargoniums are grown for the oil ‘geranol’, which is extracted from the leaves and is an essential oil much used commercially in perfumery. The scent of some species growing in their natural habitat, acts as a deterrent to grazing animals who appear to dislike the emitted scent. Conversely, it also attracts other insect life to visit the bloom and pollinate the plant. The scented leaves can be used for potpourri and they also have a use as flavourings in cooking. Occasionally scented types can be found in the some of the other groups mentioned i.e. the Angels having P. Crispum in their genes can often have a strong citrus scent. 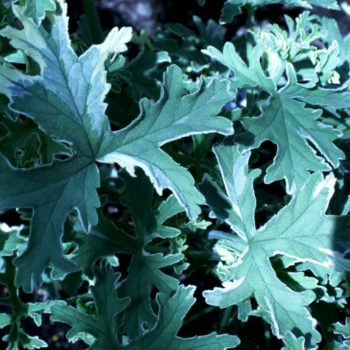 Pelargonium dichondraefolium, an evergreen plant also known as ‘Black Pepper Scented Pelargonium’. It has a height and spread of around 12″ x 18″. Its foliage is green/blue and it has an unusual scent of black pepper, though some people describe the scent as that of balsam. The flower is white with red feathering. Pelargonium ‘Clorinda‘. This sprawling pelargonium has a sweet, aromatic, woody scent (sometimes described as eucalyptus or cedar scented). It grows up to 3ft in height. It has coarse, mid-green coloured foliage. The large pink flowers are feathered with red and purple. 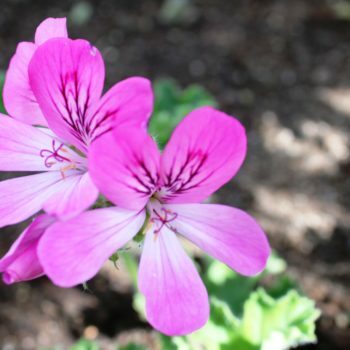 According to the website geraniumsonline.com “In earlier times, ‘Clorinda’ was considered one of the Unique pelargoniums, but more recently it has been listed with scented leaf geraniums. 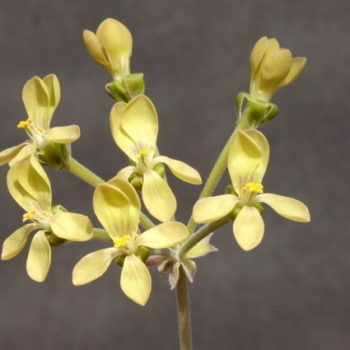 The best ‘guesstimate’ of its parentage is as a hybrid between Pelargonium quercifolium and some unknown regal (e.g. p. domesticum). This is an “oldie but goodie” plant, best grown in the ground or in a large pot”. Pelargonium graveolens ‘Lady Plymouth’. 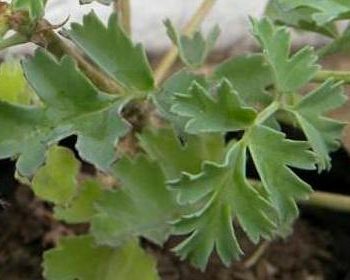 This plant has pale, grey-green leaves with a white border. It’s flowers are small and lavender coloured, growing in clusters. The leaves are rose-scented. 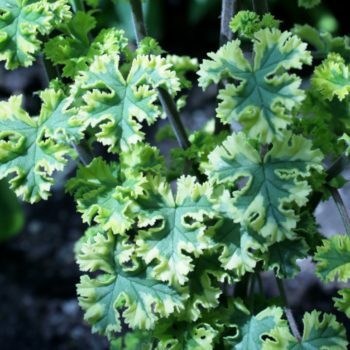 It’s thought to be a variegated form of Pelargonium graveolens , which has the same leaf form but darker and without the pale edging. 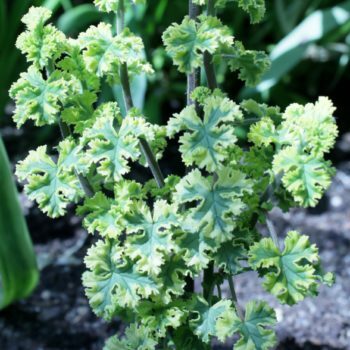 So it is also known as Pelargonium graveolens variegata. Pelargonium filicifolium (species). This is an unusual member of the pelargonium family as its foliage is quite different to the others. 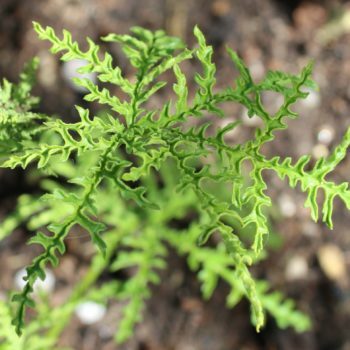 The leaves are deeply incised and almost like ferns. The foliage is described as tacky or sticky, and has a balsam scent. 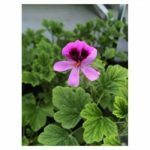 Its flowers are very small and like other pelargoniums are pale purple with deep red feathering. It grows quite tall on a woody stem. It’s much sought after by florists for the upright, scented foliage. 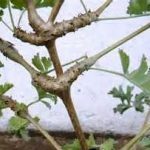 Unlike many of the other pelargoniums it’s not suitable for eating. Pelargonium graveolens ‘Rober’s Lemon Rose’ This is another graveolens cultivar. 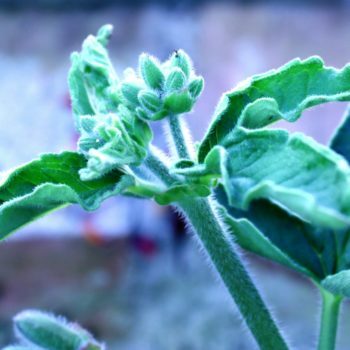 Its leaves, which are often described as tomato-like or potato-like, are quite soft and hairy and give off a lemon-rose scent, as the name suggests. 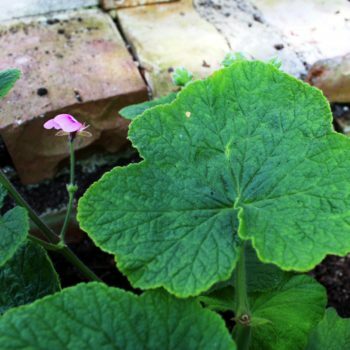 It’s a large, sturdy, fast-growing pelargonium which would require a large container or planting in the ground. Like the ‘Clorinda’ it can grow to 3 ft and it blooms from Spring to Autumn. Pelargonium citrosum ‘Orange Fizz’. 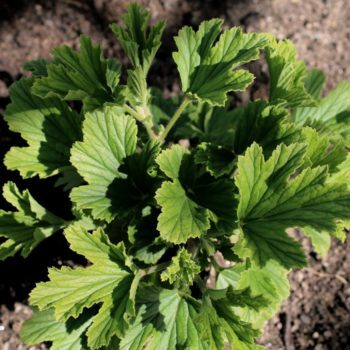 As the name suggests this pelargonium foliage releases an orange citrus fragrance. It has strong, coarse leaves. 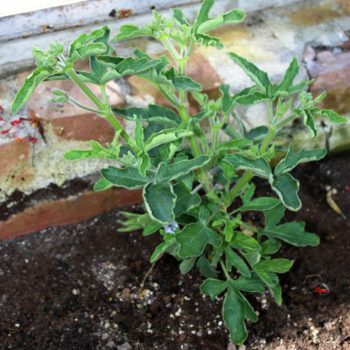 Its growing habit is stiff and upright, growing to around 2 ft. Like the other new plants, it has pale purple flowers with deeper blotches on the upper petals. Pelargonium crispum ‘Cys Sunburst’. 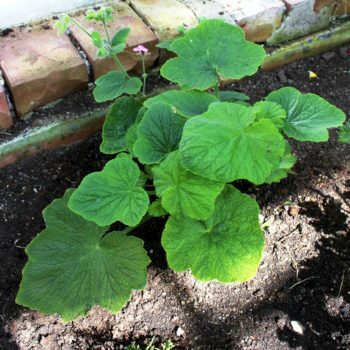 This is a compact, upright plant with small gold and green leaves. It produces pale lilac flowers in summer. Like the other pelargonium flowers, the top two petals, which are slightly larger than that lower ones, are feathered with dark purple. Its citrus smell is as good as that of its parent, p. crispum. This American variety grows slowly to a height of 20″ with a 12″ spread. Pelargonium capitatum (‘Pink Capricorn’). 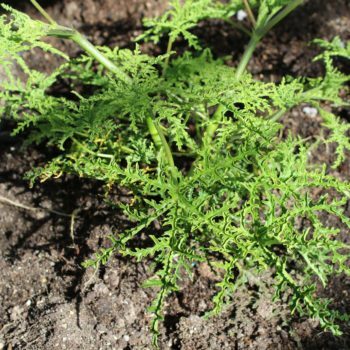 This spreading plant has three-lobed leaves which are covered in soft hairs and feel silky to touch. They give out a smell of citrus rose. The flowers are dark pink with a white eye. It is fast-growing to around 18″ with a spread to 3ft. It flowers from April to October. Pelargonium papilionaceum (species). Otherwise knows as butterfly pelargonium or by its South African name, rambossie. 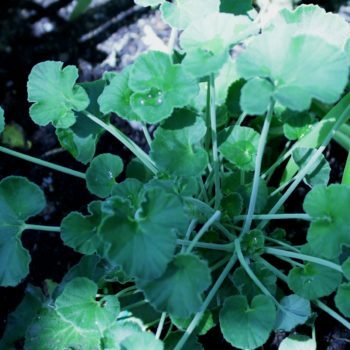 The leaves are heart-shaped and minutely serrated. 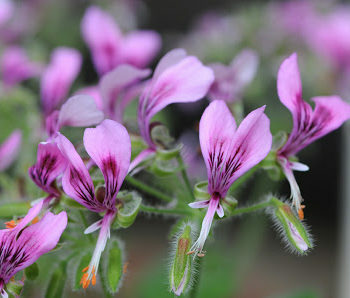 According to the website planzafrica.com, this pelargonium has been cultivated in Britain since 1724 and was grown in the Chelsea Physic Garden. Where it grows naturally in South Africa, it is described as having the smell of a ‘he-goat’ and it has reportedly been used as a tobacco substitute. The flowers are dark pink with the top two petals reflexed and much larger than the lower three. It likes shade. It’s a large plant which can grow to 2m with a spread of 1m. 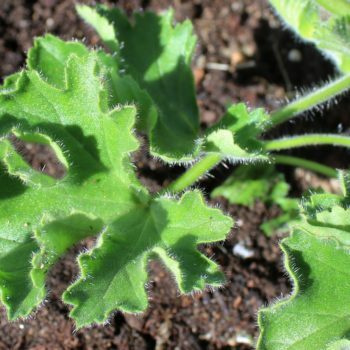 Pelargonium gibbosum (Gouty Pelargonium/Knotted Pelargonium). 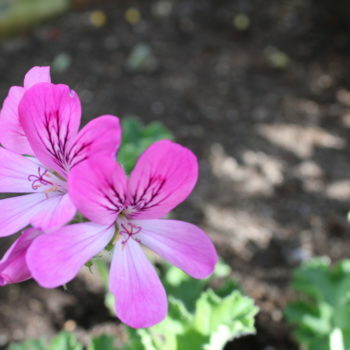 This unusual member of the Geraniaceae family was given the name pelargonium by Charles Louis L’Heritier in 1789. It is a semi-succulent pelargonium. The name ‘gouty’ comes from the long stem segments which appear to have swollen joints. 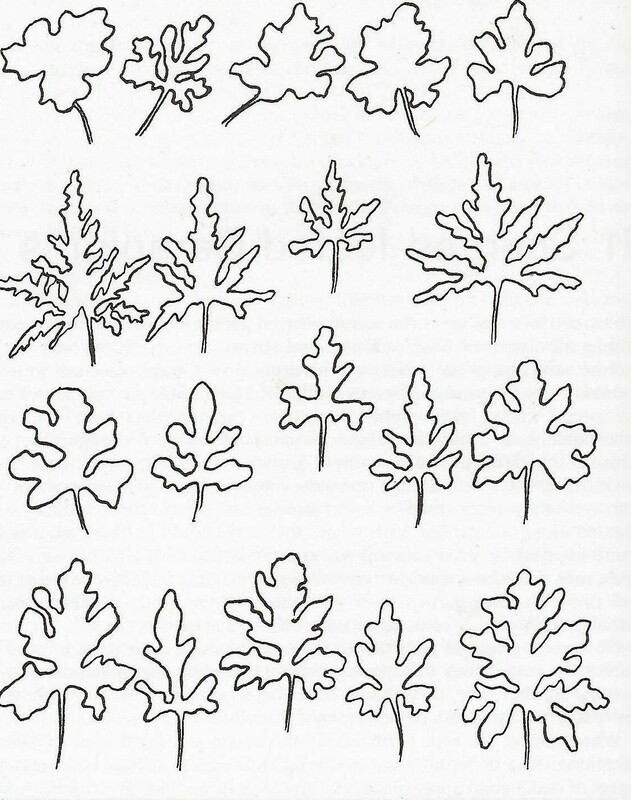 These stems will develop a caudiciform shape over time, growing up to 2″ in diameter. This leggy plant will grow to a height of 2ft, sometimes requiring support. 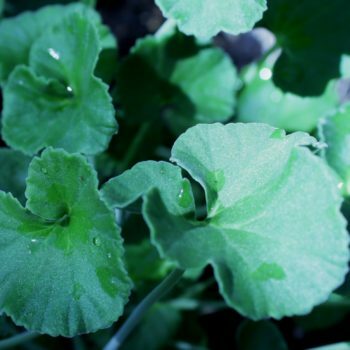 It has deeply-cut, blue-green leaves. Sometimes it will become dormant in the summer, dropping its leaves. The flowers are a greenish-yellow and its known for its strong scent at night-time. 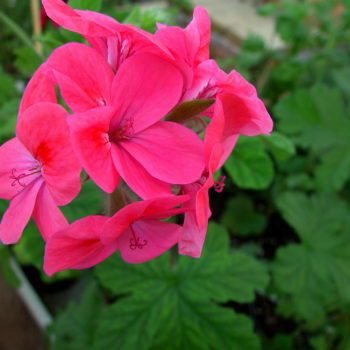 The scent of a pelargonium is contained in the small beads of oil produced in the glands at the base of the leaf hairs. Bruising or crushing the leaves breaks the beads and thus the plant releases its scent. The Victorians considered these scented pelargoniums to be herbs, used in cooking or infusing to make tea. 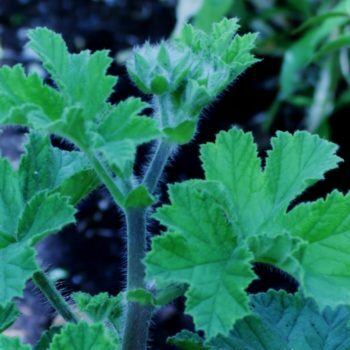 Pelargonium graveolens is used as a relaxant and to treat inflammation or excessive bleeding. 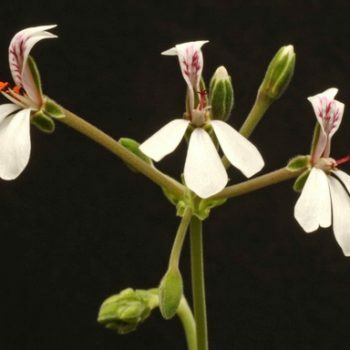 Pelargonium sidoides is considered a medicinal plant in South Africa where the root extract is used to treat colds and flu. 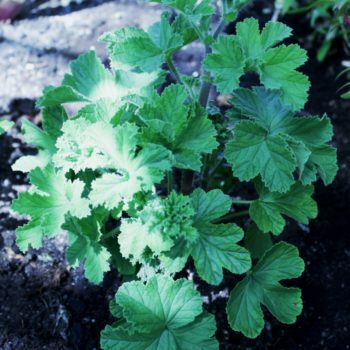 Pelargonium citrosum (citronella) is used to keep mosquitos and other biting insects at bay. Once the pelargoniums are well-established in our Victorian Frameyard, we look forward to propagating them so that our visitors can enjoy the many benefits of these tactile and versatile plants.